Documenting business processes using process models is common practice in many organizations. However, not all process information is best captured in process models. Hence, many organizations complement these models with textual descriptions that specify additional details. The problem with this supplementary use of textual descriptions is that existing techniques for automatically searching process repositories are limited to process models. They are not capable of taking the information from textual descriptions into account and, therefore, provide incomplete search results. 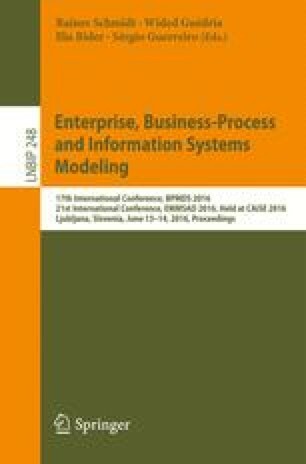 In this paper, we address this problem and propose a technique that is capable of searching textual as well as model-based process descriptions. It automatically extracts process information from both descriptions types and stores it in a unified data format. An evaluation with a large Austrian bank demonstrates that the additional consideration of textual descriptions allows us to identify more relevant processes from a repository.